During the Bunsui Oiran Dochu, three “Oiran” (courtesans) dressed in gorgeous costumes and wearing 15-cm tall black-lacquered three-pronged Geta parade in a distinctive gait called “Sotohachimonji”. 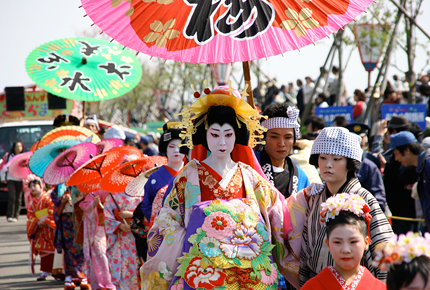 Taking place on a walk called “Okozu-bunsui” with sakura blossoms trees on its sides, this colorful parade of “Oiran Dochu” of a very rare style in Japan is fascinating for the spectators. Honjoji Temple Ogre Dance is one of the big annual events taking place in the Head Temple of the Hokke Sect in Honjoji Temple. 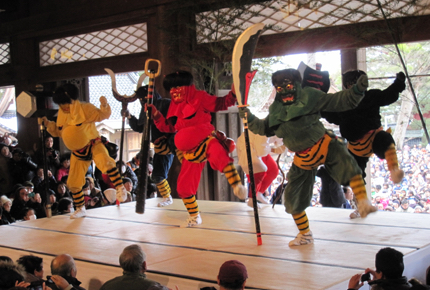 Following the historical fact of Muromachi period Honjoji Temple warrior monks and peasants who drove off bandits by joining forces, this event has been a long-standing ceremony performed to exorcise evil spirits by throwing beans. The vision of rampaging ogres armed with saws and axes, and the sound of their screaming voices resounding in the solemn atmosphere of Honjoji Temple are very impressive to experience. In the end, visitors throw soybeans to drive the ogres away and then pray for peace and safety. 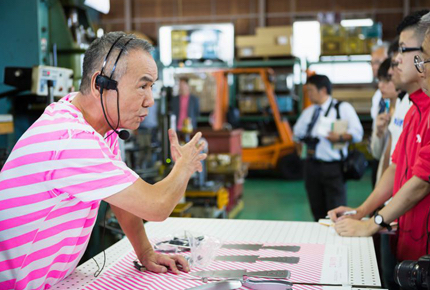 The Factory Festival is the event held in the metalworking production area of Tsubamesanjo region, Niigata Prefecture. The factories in the region open all together at once. In this festival held in factories that are usually closed to the public allowing you to visit various factories and experience manufacturing, you can look directly at the craftsmen in action, interact with them and also participate in workshops. No doubt that to see manufacturing from the inside will be a chance for many people to make new discoveries. 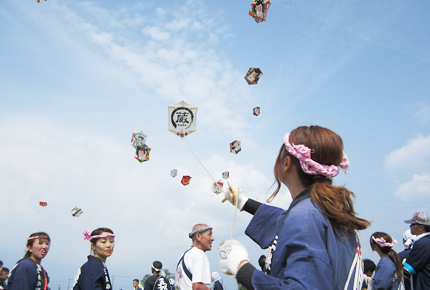 It is said that the Sanjo Great Kite Battle originated around the Edo period as a competition between the children of Murakami clan bureaucrats and the townspeople children. The powerful vision of air battling large hexagonale kites, having a size of approximatively two and a half tatami mats featuring pictures of warriors drawn in vivid colors, launched high in the early summer sky is indeed an impressive one. Copyright © Tsubamesanjo Regional Industries Promotion Center All rights reserved.